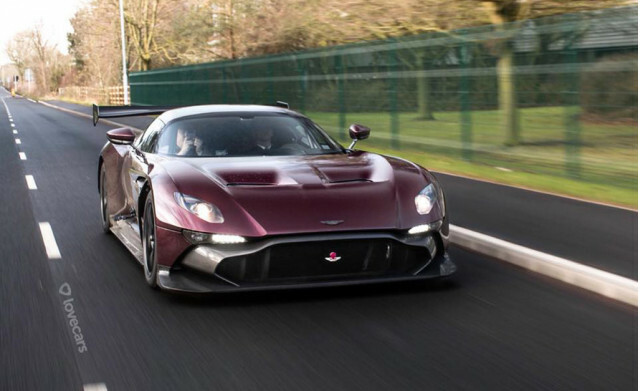 There are only 24 Aston Martin Vulcans in existence and so far just one of them can be legally driven on the street. With Aston Martin’s blessing, British motorsport and engineering firm RML Group has completed the first road car conversion for the track-only supercar. It’s no easy task as unlike the rival Ferrari FXX K and McLaren P1 GTR track cars, the Vulcan isn’t derived from a road car so getting one to street-legal status has involved significantly more effort than the similar road car conversion for the P1 GTR that was conducted by Lanzante Motorsport. Thankfully, RML Group has plenty of experience in building wild cars for street use. This is the same company after all that built the Nissan GT-R-powered Juke-Rs earlier this decade. You can already see that the Vulcan has been fitted with a set of headlights from a DB11. The side mirror caps were also borrowed from the Aston grand tourer. But as we learn in this video from YouTube channel Lovecars, there are many more modifications under the skin. Most of these have been implemented for safety reasons, as well as ensuring the car can handle ordinary roads. The list includes suspension, steering and brake changes, as well as tweaks to the 6-speed sequential transmission, the latter to make launches smoother. There are also new indicator lamps as well as a clear lens to preserve those signature LED taillights. The body work also needed to be changed to reduce the overhangs and a lift kit was installed to help raise the ride height some 30 millimeters. The cooling systems for the Vulcan’s monster 7.0-liter V-12 also needed to be upgraded as the car will now be required to stay cool in stop-and-go driving. It should be noted that it’s easier to make a track car legal in the United Kingdom and Europe than in the United States due to single vehicle type approval rules over there, so RML’s conversion may not be applicable for the handful of Vulcans on these shores. An additional 3-4 Vulcan owners are also expected to have their cars converted for street use. Given the popularity of the service, don’t be surprised if a few owners of the track-only version of the upcoming Aston Martin Valkyrie also call on RML to have their cars converted for street use. Fortnite on iPhone X vs PS4 Pro vs PC: What&rsquo;s the Best Way to Play?